141 Ewbank Garden Drive B, Hendersonville, NC 28791 (#3459234) :: Caulder Realty and Land Co.
Only minutes from historic downtown Hendersonville. 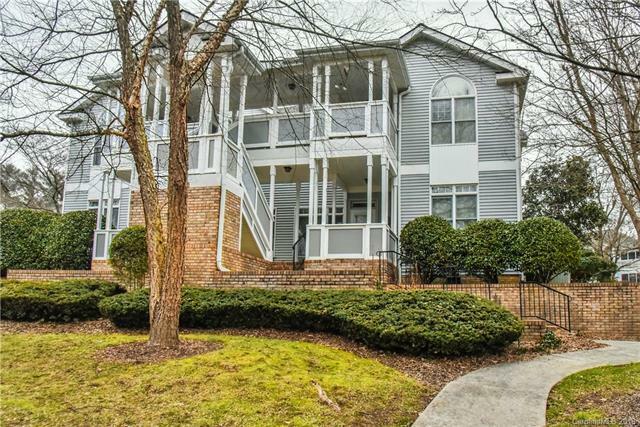 Premium one story, ground level, end unit Condo in desirable Ewbank Gardens. All new laminate wood floors throughout with no carpeting. Light-filled 2 bedroom, 2 bath unit with 9' ceilings throughout and screened rear porch to enjoy the well manicured green spaces. Large open living room with brick fireplace and gas logs opens to large dining room with bay window. Spacious master suite with 2nd bay window and en suite master bath with double vanity sinks, walk in shower, oversized corner jet tub and oversized walk in closet. Fully equipped kitchen with all appliances included opens to breakfast nook. Close to Pardee hospital and local shopping. One car assigned parking space with ample guest parking at rear of building. HOA allows pets under 30lbs (buyer to verify).